Manufacturer only ships using UPS or FedEx. Please make sure to choose UPS or FedEx options only when checking out. The golden brown double-wall deluxe pet casket is an elegant choice- fully lined with brown satin deluxe, hand-sewn pad, pillow, attached skirting and lining in the top to create a special final resting place for your faithful friend. Available in 24" size only. 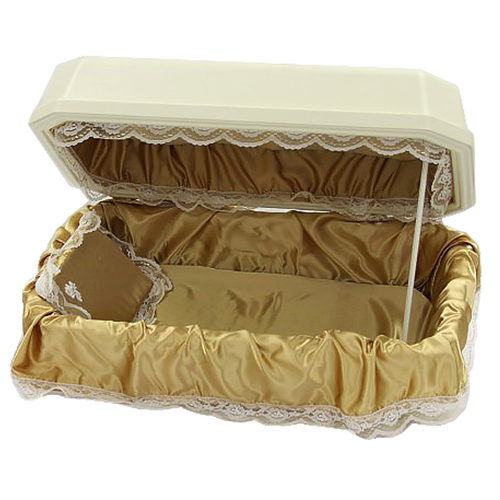 The pet casket is designed to restrict seepage of water and the intrusion of air with aid of the included sealant. Proudly made in the USA. 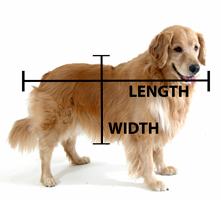 Length: measure from the tip of the nose to the base of the tail. Width: measure from the knees to the top of the back. 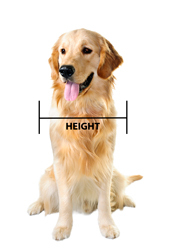 Height: measure from outside of shoulder to outside of shoulder. 25% casket restocking fee. Please note that our manufacturers charge a 25% restocking fee for all caskets.